Paul is a physical oceanographer who grew up with an interest of the sea from a young age that developed from listening to his grandfather's stories as a deep sea trawler skipper. Many years later and after many years living inland away from the oceans, a developing interest in fluid dynamics and numerical methods gained while obtaining a B. Math degree from the University of Waterloo in 1990 brought Paul back to the oceans. This then led to an MSc from McGill in 1992 and a PhD from the University of Victoria in 1992. 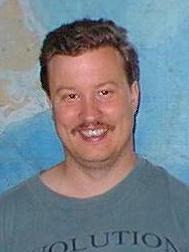 After 3 years working in the United Kingdom at the University of Edinburgh as a postdoctoral research fellow, he returned to Canada to take up a faculty position at Memorial University of Newfoundland, before moving to the University of Alberta, where he can be presently found as an Associate Professor in the Department of Earth and Atmospheric Sciences. Today, Paul's research is a mixture of data analysis as well as numerical modelling. He is interested in the role of freshwater in the North Atlantic, both in terms of observed changes as well as how to properly represent this quantity in numerical models and what those models can tell us of observed variability. Linked to this is a desire for a greater understanding of the links between the Atlantic and the Arctic Oceans, and especially the role that is played by the straits and passageways of the Canadian Arctic Archipelago. He also does some work on the Gulf of Alaska and the North Pacific. Finally, he is heavily involved in the effort to develop ocean general circulations based upon the principles of unstructured numerical methods (such as finite elements). When he is not at work (which he says seems to take far too large a percentage of his time), he spends time with his wife Jennifer and son Conlan, as well as his hobbies which include reading (especially history and science fiction), computers and role playing games.